Caught at last! After a three-week man-hunt, the victim is in a corner, trapped, he must squeal. The victim is Irishman, Rory Gallagher, a reputable guitarist, and the information wanted ---- up-to-date report on his mission in the United States of America and other matters pertaining to his band. Gallagher won't get away this time. "Keep your eyes on him" they told me. "He's a crafty one." They were right. Even as we are introduced, his eyes scan the surroundings, constantly searching out an escape route, but there are none. He seems to have accepted the situation and eases himself into a soft chair before taking a sip from a half pint of beer. We've go him at just he right time. He has just returned from a 26,000 mile trek of the States and is leaving for a very short holiday in Ireland in a few hours time. He has just got out of bed and isn't in the mood for running. He spends 90 per cent of his time running from continent to continent, from country to country, city to city. In a few days time, he's off on a tour of Germany, then Switzerland, France, Belgium, Holland, then back to America again and then...... a tour of Britain. Sure is hard to keep the boy in one place for a chat, we've got him this time though. "The tour went well. I liked the States although it was a bit hectic. We spent six weeks there playing almost every night. The band and myself hadn't got much chance to rest because of the energy crisis. Flights were restricted with the result that sometimes we'd get about three hours sleep before being wakened to catch a plane," Rory said. 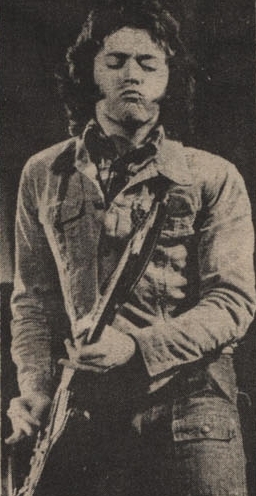 It was Gallagher's first Stateside major headlining tour. By all accounts, it was a mighty successful one, with sell-out concerts and rave reviews. Gallagher and his ultra-tight band blew the mind of many of a rock fan there. "People were coming along to shows and shouting for my songs, which was fine. I think we need an album hit there now and the live one "Irish Tour '74' is going in the right direction. That could do the job for us, " he added. Rory liked touring in the States for more than one reason. Apart from the joy of playing to packed houses, he got a chance to see some of his favourite musicians. "I had the opportunity of seeing and playing with a lot of old blues names. It was invigorating to see my favourites." A new Gallagher studio album will probably be recorded in England in the autumn for release early next year. The songs are already written. Rory will record a Leadbelly number as well as a "folky sort of traditional song." "For the album, I'll probably just use the band, but one or two other guys might play on a few tracks. I like to just use the band on albums because it is better for audiences at live performances, they can identify the album with what they see on stage. There's nothing missing." Many people have said that Rory should use a brass section both on stage and on record. In many instances, he is accused of not developing his music. His reply, and a valid point he has, is: "I've considered using a brass section, but I'm very happy with what we have at the moment. Brass is lovely, but it is very disciplined on stage because a section can't just pick a riff out of the blue." We talk about his next British tour, when we will play major venues, and his last when he gigged at small halls. "The last was like a mini-tour, at universities and places like that. I did it for a change, to break away from the big deal concert tour thing. I might do it again next year, they do me good. It's bad to get regimented into doing one tour of big gigs a year. It's fun to do the smaller places, " he said. "The amount of work on the diary restricts what we can do, we would really need 24 months in the year to cover everything." I looked at my note pad for a second, it was enough. I should have never taken my eyes off him. Gallagher took his chance, he was away like a shot. Honest, boss, I thought I had him. He'll be back at Christmas for a tenth of a second, I might see him then. This article comes from the 10/5/74 issue of DISC magazine.